Was it a poor show, judging by standards that the Headies had earlier set? Yes. The production failed to cover itself in glory. And a number of reasons can be put forward as causes. But the bottomline shows that the organisation was substandard. It’s quite the year for the Headies. This marks the first time that two Headies Awards shows will be held in one calendar year. Wasn’t it just yesterday that Don Jazzy and Olamide were going at each other, while the rest of Nigeria watched on in delight, disgust and concern? The second 2016 Headies rolled into town, with the bar set in the hearts of fans to expect uncertainty. Many people wanted something special, although no one had a clear picture of what they had in mind. For many others, they just wanted a show to rival the best of what the US had, and what MTV was doing on the continent. These people were left disappointed. Everyone was left disappointed. Everyone who wasn’t a winner. It has been a difficult year to run business in Nigeria. The country is suffering from the effects a recession, which has destabilized businesses, with inflation and the a downward spiral of the Naira having negative ripple effects on business, and the standard of living. It’s a tough year to secure sponsorships, and the Headies felt the weight of it. The event ran without a headline sponsor. Viewers from home who watched a live feed mostly complained about the poor quality of the pictures and audio, while the production of the show failed to impress. The ideas were large and designed to be effective and entertaining, the performances all planned out, and the awards looking very shiny. But execution left a lot to be desired. Compared to last year, and the year before that, the Headies started on time. Shout out to Ayo Animashaun who gave the the thumbs up for the show to be kicked off when 90% of the nominees and eventual winners were absent. Lateness is a culture of the country, and the Headies was disrespected by the stars who were blatantly late. Empty seats in front, made the affair look a bit unattended and sparse, and eventually took something off the general shine of the event. Transitioning was a big issue, with drags and friction marring the entire production. 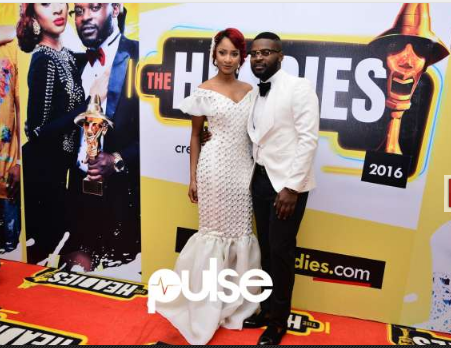 Hosts for the night, Falz and Adesua Etomi, were amazing. They didn’t have enough practice, but they combined humor, wit, slapstick displays to put out a good performance, and salvage what they can. 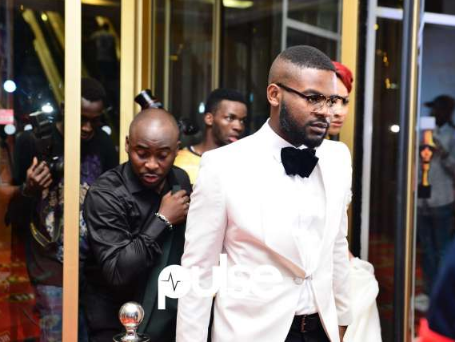 Falz and Etomi gave music performances, were glowing in fashion, and also scored a winner with the funny depiction of Bobrisky. The show initially had a very low turnout of celebrities. Their absence was glaring with numerous nominees and awardees absent at the award. Notable absentees were the entire members of Mavin Records and YBNL Records, two music companies whose bosses had a bitter spat at the previous edition. Simi failed to claim her award for “Best Vocal Performance”, Kiss Daniel failed to claim an award, Illblisss who was a big winner in two categories, Patoranking who won the Best Reggae/Dancehall single was absent, and Olamide won two awards, but was a no show. Lateness and a heavy December schedule for many star acts ensured that holes were left in the ceremony. 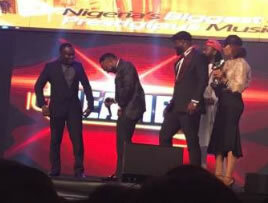 The magic of the Headies was on display as Kcee and Harrysong reunited on stage. The former label mates were best of friends and frequent collaborators during their time at until November 2016, when Harrysong abruptly split from the group and swiftly set up a new music company, named Alter Plate. There was drama too. 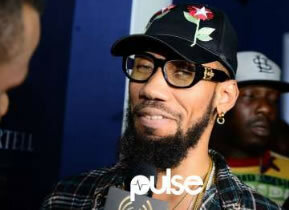 It was an embarrassment for Phyno, as the rapper failed to pick up any gold trophy. Phyno who appeared late and had a ceremonious entrance, was awarded the Song Of The Year for his efforts on ‘Fada Fada’, came out to receive his trophy. The rapper opted not to give an acknowledgement speech, grabbing the mic and coldly muttering "Me I no get speech o, Thank u for the award"
But no trophy was handed to him. No assistant usher brought any trophy on stage for the star, and he was made to walk back to his seat empty handed. Midway through the walk, he met up with Ayo Animashaun, the organiser of the award and laid his frustration.One of the events that will forever be ingrained in the hearts of the audience was Wizkid snubbing Eva Alordiah's fiancé, Caesar. Wizkid walked into the venue almost at the last hour sending the crowd into a frenzy. While walking past he reached out to hug someone, Caesar thinking it was him, stretched his arms only for Wizkid to ditch him and hug Eva. The event was later ended abruptly. With a number of awards not presented and Flavour showing up to round it off. But if you can look away from this year’s production and see the bigger picture, then you will have a deep sense of admiration for what Ayo Animashaun has done with the Headies. It’s Nigeria’s most consistent and prestigious music show, standing out as the yardstick for measuring the best in the country. This year's edition is the 11th.